The client is the owner of a large, state-of-the-art, residential property overlooking Coolangatta with fantastic views of the coastline and hinterland. The enjoyment of their lifestyle was marred by an electricity bill of approximately $4800 per quarter. 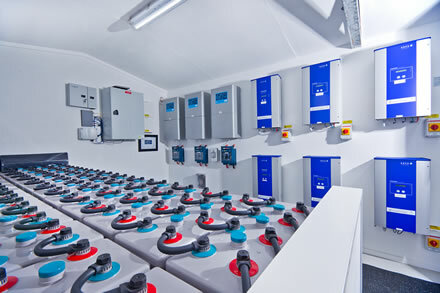 The client had consulted other solar companies before approaching Enertech Solar and had been told his vision of a Solar Hybrid storage system could not be achieved due to the need for long cable runs and lack of roof space. Enertech Solar were not deterred by such constraints and designed and installed a system that far exceeded the client’s expectations. Enertech Solar closely monitored the energy usage at the site for 2 months and established that 80% of the load was used at night – not an ideal load pattern for self-consumption of solar. Another challenge was the where to locate the components of the solar and storage system. The roof of the home was unsuitable for roof-mounted PV panels so ground mounted arrays were required. The PV arrays, generator and inverter/battery shed were all located some distance from each other which necessitated long cable runs through landscaped areas which already contained underground electrical, water and fibre optic network services. The final challenge was a utility imposed fixed export limit which required zero solar-generated power to be sent back to the electricity grid. After comprehensive monitoring, Enertech Solar had a clear idea of the size and timing of the loads. The next goal was to reduce the loads where possible, and then shift them to daytime in order to take advantage of the solar generated power and to reduce the size of the battery bank needed to cater for night-time loads. Seven 5kW ground mount arrays were positioned at specific orientations to target known loads throughout the day. The ground work trenching was carefully routed through the woods so as not to cause too much disturbance to the lawns. Secure ground fixings were used so that no excavation, soil removal or concreting was needed. The layout of system components was very carefully considered. The ground mount system was located to optimise solar collection. 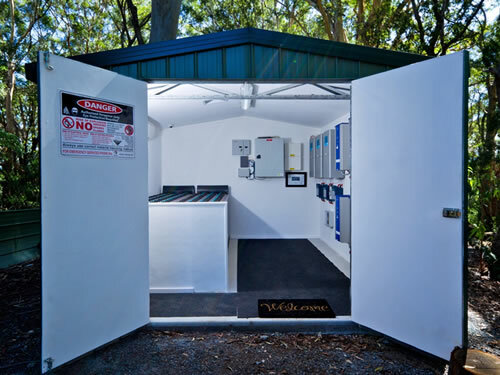 The inverter / battery shed is fully insulated and built at the edge of a tree line, providing complete shade all year round. An efficient inverter air conditioning unit keeps the room at 20°C as per inverter and battery manufacturers’ specifications. 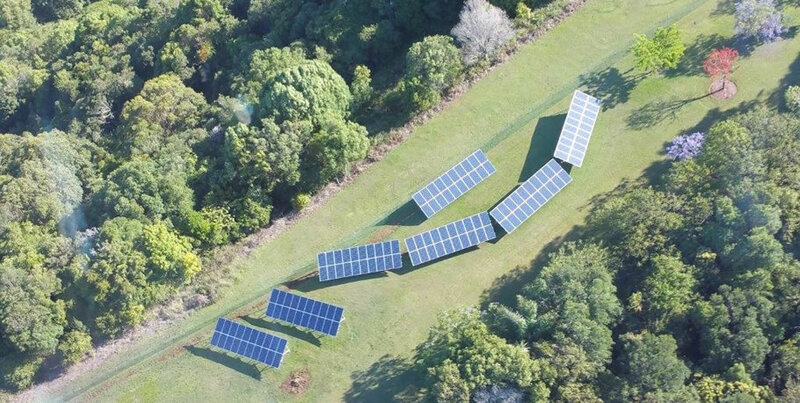 The generator is located 350m from the inverter/battery shed, however Enertech Solar custom-designed a remote three phase auto start generator program that runs on the property’s sophisticated internal fibre optic communications network. Selectronic SP PRO GO series inverters have factory locked export limits. A zero export model was installed to satisfy the utility requirement of no export to the grid. 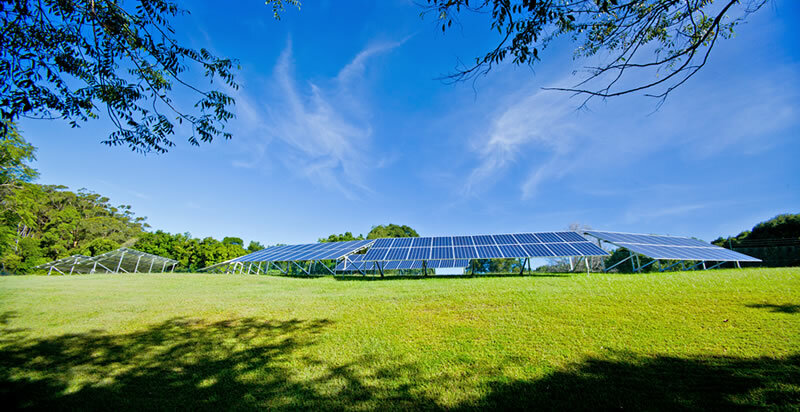 The customer no longer relies on grid electricity to power the property. Quarterly power bills have been reduced by 96% (from $4800 per quarter to $200) with an annual saving of approximately $20000 per annum. It is estimated that the system will fully pay for itself in eight (8) years. The system has been programmed to take the battery bank down to 25% DOD each night to feed the night-time loads. Usually, the battery bank is fully recharged by midday each day while at the same time the solar is able to supply the property’s entire loads. Additional benefits include a bespoke monitoring system designed by Enertech which allows the client to not only view every part of his system via a computer or mobile device from anywhere in the world but also allows him to control elements such as the generator and pool heater pump remotely. This innovative installation was a finalist in the Battery Backup category of the 2016 CEC Design & Installation Awards.